The 'Isotype revisited' project celebrated the launch of From hieroglyphics to Isotype on Thursday 20 January 2011 at the Austrian Cultural Forum London, in Knightsbridge. The event was kindly hosted by the ACF London, in collaboration with publisher Hyphen Press and 'Isotype revisited'. The evening was introduced by ACF London Director Peter Mikl, who gave an overview of Otto Neurath and Isotype. Robin Kinross followed with thoughts from his perspective as publisher. Eric Kindel offered brief remarks on behalf of the project before passing over to Christopher Burke, who spoke at length about aspects of the work he and co-editor Matthew Eve undertook in making the book. Robin Kinross's remarks are appended below, followed by those of Eric Kindel and Christopher Burke. Our thanks to the many friends and supporters of the ACF, Hyphen Press and 'Isotype revisited' who attended. My position, as publisher of this book, stands between our hosts here at Rutland Gate and the people at Reading who generated the book. First I want to thank the Austrian Cultural Forum for its generosity, as a host and supporter of what we have been doing. By the Austrian Cultural Forum, I mean Peter Mikl and Waltraud Strommer. As you will hear from the other speakers, this book is one part of the larger 'Isotype revisited' research project at the Department of Typography at the University of Reading, and the exhibition that is now on at the V&A is another component of this effort of research and publication. So now I turn my attention to the generators. I want to take this public opportunity to express my own pleasure at what the group at Reading have been doing. I need to explain that my own involvement in the topic dates back to when I was a student in the Department at Reading, in the 1970s, when the archive had been freshly acquired for the university, by Michael Twyman, and when Marie Neurath used to come and give seminars in the Department. I was part of a group of students who in 1975 made an exhibition of Isotype work, and then I did postgraduate work on it. I have the proud claim to be the last employee of the Isotype Institute, which helped to support the work I did on cataloguing the archive at Reading. My involvement carried on into the 1980s: I worked with Marie in the translation and editing of Otto Neurath's writings, including a complete edition of his writings on visual themes, which was published in Vienna in 1991. In 1986, when Marie Neurath died, I turned to the Austrian Institute, as it was called then, and they hosted a memorial meeting for her, here at Rutland Gate. Marie was German, not Austrian, but the work that she had become so identified with was thoroughly Austrian in its origins. However international it was in orientation, Isotype - the 'Wiener Methode' - belonged initially to the civic-socialist Vienna of the 1920s and early 1930s. Thinking about this research project, what I see now - and you can see it in this book we have produced - is that history doesn't stop. Our efforts in the 1970s were important and substantial. But now a different set of people have come back to the same material, have been giving it a different kind of attention, are seeing it in other lights, and are asking different questions of it. I remember that during my own postgraduate research I spent a couple of days going through the typescripts that are the basis of the text of this book. There are several drafts and versions, and they are not or did not seem to be, chronological. I could find no primary text. I became annoyed, even, with Otto Neurath's absolutely phenomenal productive energy: that he could generate all this, and so much else at the same time. I sometimes wished he had been neater. I thought then: I simply don't have enough time for this, let's look at other things in the archive. It was also important for me, thirty years ago, to meet, talk with, correspond with, the people who had been involved with Isotype and who were then getting on in life. Now they are all almost gone. Further, I did not even begin to look at Otto Neurath's collection of graphic material, which is now published, in part, in our book, and which gives it such life. So I am very grateful to the project, and in particular Matthew Eve, co-editor of this book, who has done just what a researcher should do. That is: work 'uneconomically' and bring hidden material to the light of day and to publication and circulation. The last speaker tonight, Chris Burke will give some exposition of the Isotype themes. With Matthew, he is an editor of the book. He also designed it, and did all the typesetting and prepared all the pictures for final reproduction. That is a huge work, which is also, in its way, 'uneconomic', if you do it properly. This is the third book on which I have worked with Chris in this way, and I have to say that our work together goes very enjoyably and smoothly. Eric Kindel also played an advisory role, as the book developed, and so did Sue Walker. We also worked with now trusted printers in Bruges. It's an example of a book made by a little group of people, who know about the content and the technics of production, and who take the decisions into their own hands. I believe it's right to claim that in this sense we were working in the Isotype way. The Isotype work was always group work, with shared responsibilities and pooled knowledge, and without a distanced authority-figure giving commands. With this you may imagine, rightly, that I am referring to someone conducting music: the conductor with his baton. My sense of what we have been doing is that it is not like this. Rather it is like chamber music. Or it is like a relay race, in which the baton is shared between participants. So in the spirit of group-work, which refuses a single authority, I now take the stick and pass it to the next one: Eric Kindel, the 'principal investigator' of the 'Isotype revisited' project. Thank you Robin. Before Chris begins, I would like to offer just a few words on behalf of 'Isotype revisited', the project from which From hieroglyphics to Isotype has emerged. We would first like to thank the Austrian Cultural Forum London for hosting tonight's event, and for their generous support of the associated display, 'Isotype: international picture language', now on at the Victoria & Albert Museum. We are very encouraged by the ACF's recognition of the continued importance of Otto Neurath and Isotype to the cultural history of Austria, and of a wider world, and that they have joined with us in bringing both to as large an audience as possible. We would also like to thank our publisher Hyphen Press, and Robin Kinross. The 'Isotype revisited' project has forged a warm and productive partnership with Robin over the past several years, though it's one whose roots - as you've just heard - extend much further back in time to Robin's early association with Reading and Isotype. It is therefore entirely appropriate, and much to our satisfaction as well, that Hyphen Press is home to a significant part of the project's work. As we have mentioned, From hieroglyphics to Isotype is part of 'Isotype revisited', a three-and-a-half year project funded by the Arts & Humanities Research Council. The project's overarching aim has been a return to Isotype, to make better known many of its activities, interests and influences. One 'return' has been to that which fundamentally shapes From hieroglyphics to Isotype: the consideration of past practices of graphic communication and how they can be seen both in their historical place and as a source of new insights relevant to present-day practice. Thus the narrative of Otto Neurath's 'visual autobiography' and its arc towards Isotype. The materials that inform Neurath's narrative, and which were collected by him, remain at Reading. They form part of the Otto and Marie Neurath Isotype Collection in the Department of Typography & Graphic Communication. This is apt, since the Department has also maintained a long-standing concern for an encompassing history of graphic communication that is integral to its teaching and research. That the Isotype Collection has actively contributed to this concern must be traced to the foresight of Michael Twyman, who we are pleased is here this evening, and who was instrumental in bringing the Isotype Collection to Reading in 1971. Finally, and as a not-quite-disinterested third party, I would like to offer my congratulations to project team members Matthew Eve and Christopher Burke, the editors of From hieroglyphics to Isotype. The book has been their joint effort: it began with Chris's recognition early on that editing Otto Neurath's visual autobiography would be a valuable component of 'Isotype revisited'; it continued with Matthew's long and sustained efforts to bring order to the complexity of the surviving texts; and it concluded with their combined work of assembling and presenting the text and accompanying visual material. The result, including their own written additions, is in my view a fine published work and one that is of great value to 'Isotype revisited'. They, together with our partner Hyphen Press, have made a book that indeed offers a fresh contribution to the history of graphic communication. With that, I'll now pass you over to Christopher Burke. Tonight I will talk about how Matthew Eve and I approached the task of turning original archive material into a book. Neurath wrote From hieroglyphics to Isotype in English, not in German - he wrote only in English for publication after settling here in 1941. He would tell friends in England that he could speak 'broken English fluently'; and in his lectures and conversations he was by all accounts very enthusiastic and could be very persuasive. But writing is another matter, and he always relied on friends and colleagues to improve his written English. Nevertheless the raw material is pretty solid. His English emerged as quite good immediately after leaving Vienna in 1934, and settling in the Netherlands, from where he began to write more letters and articles in English. One of his first contacts in the UK, the philosopher Susan Stebbing, said that she liked his English even when it was not idiomatic, and there's something very convincing about it, even when it's not quite grammatical. Neurath always had an inclination towards British philosophy, particularly utilitarianism, and away from the German philosophical tradition. Interestingly, he remarked late in his life that, even when living in Austria, he used to write things in a simple English to express himself more concisely and then translate them into German. He thought that the German language had a tendency towards convolution. In the Otto & Marie Neurath Isotype Collection there are seventeen folders of material relating to the book; these contain six different written drafts, ranging from disjointed notes and lists to edited, fair copies. It was Matthew's rather daunting task to trawl through all the draft versions, comparing them and tracing often minor differences. The final draft in the collection was edited by the filmmaker Paul Rotha and Marie Neurath for publication after Otto Neurath's death. But the idea of publishing it as a book was dropped at that time; only a shortened version of it appeared in the periodical Future books (vol.3, 1946). I only came across this letter after we'd finished work on the book, but this is precisely what Matthew suggested we do - go back before the final draft, made after Neurath's death, to effectively the last one made before he died. This was because Paul Rotha and Marie Neurath began to rewrite some passages and to change Neurath's style. But their posthumous version was useful in terms of structural changes, and some of these were adopted for re-ordering the earlier version of the text. Neurath admitted that his was not an elegant written style, but he tried to make it simple and precise. This relates to the position he took as a member of the Vienna Circle and as a logical empiricist about using easily understandable, everyday language to explain things. His view is reflected in a document that he prepared for Paul Rotha at the time he was writing his visual autobiography. It is reproduced in the book although it doesn't pertain directly to work on it but instead to the collaboration of Neurath and Rotha on making films in the 1940s. This [image below] is a late version of what Neurath jokingly called his index verborum prohibitorum, a list of 'dangerous words' that he had been compiling since his student days in the early years of the twentieth century. He thought it best to avoid these expressions altogether because they lead you into murky, metaphysical depths. He proposed this idea on several occasions but did not try to impose it. He did attempt to stick to it himself, however, and this gives a certain timeless quality to what he wrote. In a way he anticipated political correctness by some fifty years. There's a problem here because this question could refer to the physical world in general, whereas Neurath was discussing perspective drawing. So the idea of representation has been introduced in a handwritten addition (possibly by Neurath), and another hand has added some necessary changes further on. The sentence then reads 'Why should one represent what is far away as appearing smaller than what is close by?' It has become awkward and the meaning has got a bit knotted, I think. This sentence put me in mind of the so-called 'Protocol sentence debate' within the Vienna Circle, which was about using simple language to make stable observation statements about physical reality. We are obviously not dealing with that here - for a start, this is not a statement but a question; yet I felt that this sentence bore some relation to that issue - it is an attempt to express something about spatial relations in a very concise way. I was also reminded of a rather less intellectual discussion from the great TV comedy Father Ted: see the second clip in this video. This simplified the sentence and made it clearer, so we took this version as a basis for its final appearance in the book (p.48). This was perhaps the most significant intervention we had to make; in general it was mostly a matter of correcting the odd word here and there, or shuffling the word-order in a sentence. Now to the pictures in book, which were an essential part of Neurath's conception of it. In fact his initial idea was only to write extended captions for some pictures. But he couldn't help himself and his text grew in scope. A virtue of the typed version that Matthew decided would be our core text is that it has red circles (probably made by Neurath) in the margin, marking where pictures should appear. This enabled Matthew to make an initial list of illustrations. Additionally, there are archive boxes full of illustrative material because the production of images was taken quite far already in the 1940s before publication was abandoned. Photographs were made from books in libraries, and some four-colour proof prints were made. These were in fact all we had for certain illustrations so we scanned them and used them. There are also two mock-ups of the projected book, which give many hints, and some original material, for the pictures that were intended to appear. In many cases we had original items that we could scan or photograph, including some books from Neurath's collection. The Isotype Collection also preserves the copious correspondence between Neurath and Adprint, the book packaging firm that he was developing the book with. Neurath was a great maker of lists, and here there are lists of pictures, and even of some books and the specific pages he wished to reproduce from them. 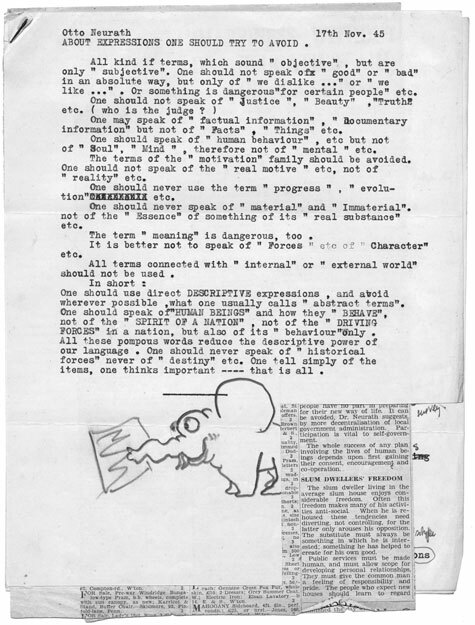 The captions for illustrations in the book sometimes contain fragments from Neurath's early drafts, which Matthew had retrieved after editing the principal text. He felt that some of the added detail given in these excerpts was worthy of recovery, and they add another layer to the text. Finally, we put together an appendix of reproductions from the remarkable collection of historical graphics begun by Neurath at the Gesellschafts- und Wirtschaftsmuseum in Wien. Our selection was informed by his text and how the items related to Isotype work: they range from various kinds of miscellaneous material, such as small, handcut silhouettes, to very large maps.